Like a resuscitation attempt that has continued for over an hour, the ABIM appears to want to flog its dying MOC program a few more times, hoping physicians haven't noticed. And they are wasting our time. Despite physicians calling for an end to MOC, the ABIM wants to maintain it. Without it, you see, they'll be bankrupt. 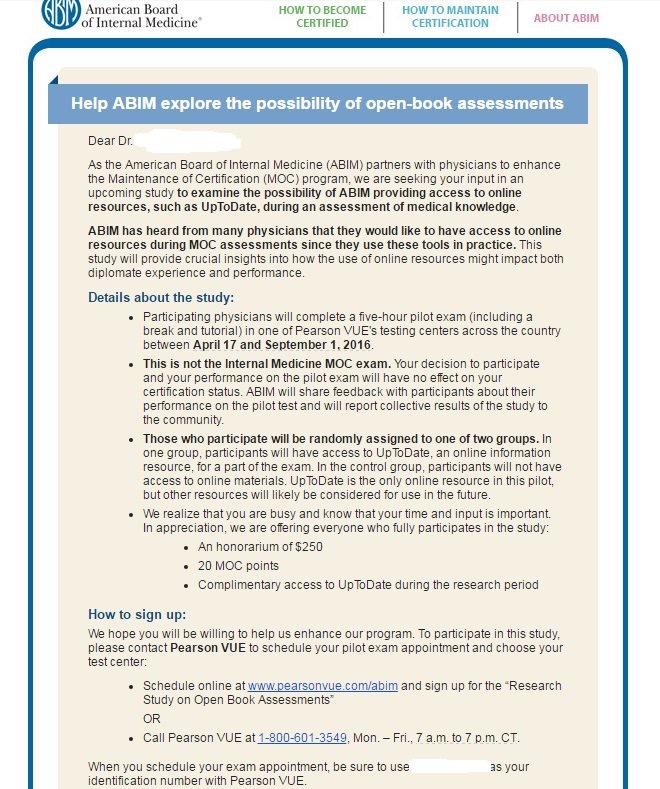 Note also that the ABIM wants to offer physicians who participate in their "research" for less than $50/hour. (No compensation is given from travel to and from the testing center). Ironically, UpToDate already makes the need to participate in the ABIM/ABMS MOC program obsolete. Third, most physicians at large hospital settings have access to UpToDate already. Fourth, 20 MOC points seems like bribery when your program is increasingly required for hospital credentialing and insurance company panel participation. Finally, I wrote the ABIM leadership over a month ago about my concerns of their MOC program in response to a "blueprint survey" request they circulated earlier. I still have not heard from anyone within the organization. This is disappointing. The ABIM needs to respond to its most fervent critics honestly and transparently. But this does not appear to be their modus operandi. As a participating diplomat in the ABIM, I would expect a response from the organization well within that timeframe if they were serious about improving their credibility. This is a recurrent theme under the helm of Dr. Baron. In fact, even Dr. Baron has never offered a credible explanation for the tax filing and webpage reporting discrepancies of the ABIM Foundation creation date and domicile location. These communication lapses are inexcusable from a professional organization that pretends to offer public trust in its services. The ABIM and the ABMS have serious financial conflicts of interest and have demonstrated highly irregular behavior for a tax-funded non-profit organization. It is not proper for a 501(c)(3) organization to have deceptive tax filings and public sanctioning of physicians after home raids to protect their monopoly on re-certification. Their testing subcontractor, PearsonVue, also uses testing "spy" firms that casts wide and unaccountable security nets as well, making the risk for physician participation in such a punative program very real. Until each of these issues are investigated, I could encourage my colleagues to carefully consider the ramifications of participating in this latest ABIM MOC research project that promises to potentiate this expensive and corrupt re-credentialing program that has never shown benefit to patient care. In its ongoing suit claiming copyright infringement against a Puerto Rican physician, American Board of Internal Medicine (ABIM) lawyers of Ballard Spahr were slapped with a Motion to Dismiss on 11 March 2016 for failure to state a claim upon which relief can be granted and for filing their suit well outside the 3-year statute of limitation for the alleged copyright infringement. The details of the motion can be reviewed at the link provided. In turn, lawyers for the ABIM have filed a request for an extension on 12 March 2016 to file their response. The details of their response will be interesting to review, especially since practicing US physicians are witnessing first-hand how the ABIM, once little more than a testing agency, exploited the learned helplessness of physicians accustomed to years of regulatory Stockholm Syndrome to take advantage of fellow colleagues for personal and political gain. Thanks to the Penn State mentality inherent to group-think corporate medicine, it now appears the ABIM plotted a strategy using intimidating strongman search and seizure tactics to invade at least one physician's home to obtain "2,000 emails and audio and other communications from physicians disclosing exam questions." 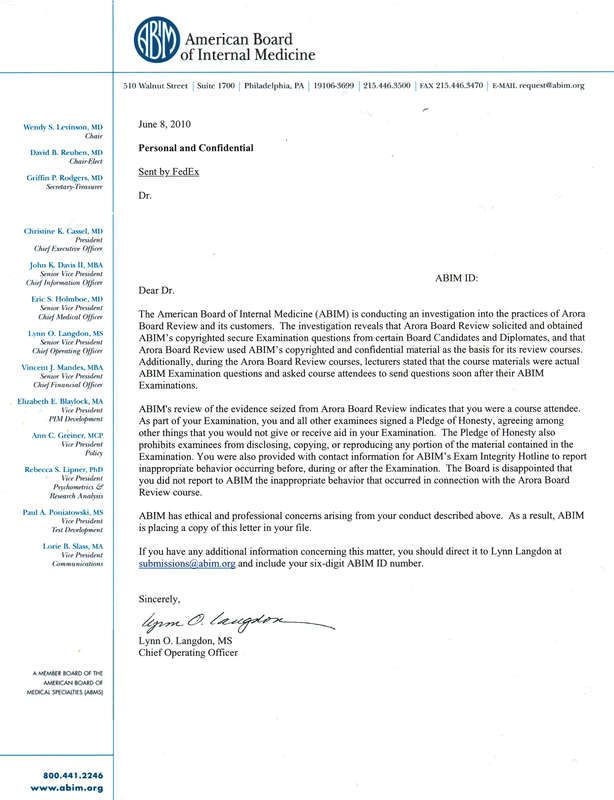 Officers of the ABIM unilaterally justified the sanctioning of 139 physicians and the distribution of heavy-handed and psychologically irresponsible letters of reprimand to thousands more as "a message and a deterrent" while pocketing millions for themselves and their corporate clients. But questions remain and loom larger now. What were the terms of the deal cut between Dr. Arora and the ABIM? Why won't the ABIM release this settlement agreement to the defendant? What personnel and methods were used to track down the Puerto Rican physician via his email communications some five years later? Why were records shredded? Why were physician attendees at the Arora course targeting when similar ACP-sponsored courses and course directors do not undergo similar scrutiny? None of these specifics were aired in the public ABIM press release about the incident. Until these are explained and justified, I believe all US physicians should refuse to participate in Maintenance of Certification (MOC) until a full investigation and accounting of the ABIM's actions and financial conflicts takes place. Members of hospital medical boards and Medical Executive Committees should insist these questions are answered by the ABIM. After all, hospitals and insurers need practicing physicians focused on patient care more than they need the ABIM, ABMS, or its member boards insisting we take strong-armed tests for their political and personal gain. To me, it increasingly appears legal challenges are mounting for the ABIM, the ABMS, and their officers as this story unfolds. As a result, I suspect there will be a pivot away from the ABIM/ABMS MOC product by the medical establishment to the new Medicare Physician Payment scheme, MACRA. But MACRA contains parts of the ABMS MOC program with its untested "performance improvement" quality metrics and patient-survey directed care that repeats a similar theme: data-gathering to pad corporate bottom lines with expensive, time-consuming, and unnecessary metrics that add little to no value to direct patient care and, instead, adds costs and detracts further from much-needed patient care. It is time to learn the whole truth behind MOC, not just for physicians' benefit, but for our patients, too. Imagine early one morning your doorbell rings. You wake from sleep and come to the door and open it. There before you is "a lawyer and a few other people from the American Board of Internal Medicine (ABIM)." They hand you a document, signed by a judge, that they can search your premises and seize things. You're confused and feel powerless to act. They enter, move to your study (home office) that contains the records of your ACGME-accredited board review course that you've given for years, collecting documents. They open your computer, taking portions of it so it no longer works. They rummage through your wife's jewelry box. They spend the entire day boxing and inventorying things that they collect, then leave. Then, some time later, a settlement deal is cut with you. One that apparently the ABIM does not want others to see. You're advised by your counsel not to bring that subpoenaed settlement agreement with you for your deposition. And remarkably, the very same lawyer that raided your home is there at your deposition representing the ABIM. Yesterday, Dr. Jaime A. Salas Rushford posted on his blog the 142-page deposition of Rajender K. Arora, MD from January 21, 2016, obtained as part of his defense of the ABIM suit filed against him. Dr. Arora ran the board review course that resulted in 5 suits and 134 physician sanctions by the ABIM as reported in the Wall Street Journal. It also prompted physician sanction letters to be sent by Ms. Lynn Langdon, Chief Operating Officer of the ABIM at the time, to thousands more. Dr. Arora's account of the raid on his home in December 2009 begins on page 62 of the posted transcript. The lawyer that came to his door is identified on page 63 (Ms. Hara Jacobs). The accounting of the search of Dr. Arora's wife's jewelry box is found on page 93. So if you've got a few minutes, grab a cup of coffee and read the deposition, especially the part about the raid on Dr. Arora's home. I have a feeling this story is about to get very interesting for practicing US physicians and very uncomfortable for the ABIM as more details about this apparent physician sting operation emerge. Related: "Strongman, Bosses, and the American Board of Internal Medicine"
There are few times when medical academics sound more foolish that when they're caught with their hand in the regulatory cookie jar. Take, for instance, this response to the recent pushback by medical students against the National Board of Medical Examiners' Step 2 CS requirement. For those unfamiliar, this is an attempt for the NBME to "standardize" the patient encounter while collecting $1250 at one of only five specialized testing centers is the US for the pleasure. Their excuse for such a requirement? "... most medical school faculty don’t have time to observe third- and fourth-year students doing a complete physical exam, so it’s important to test those skills as part of the licensing process. 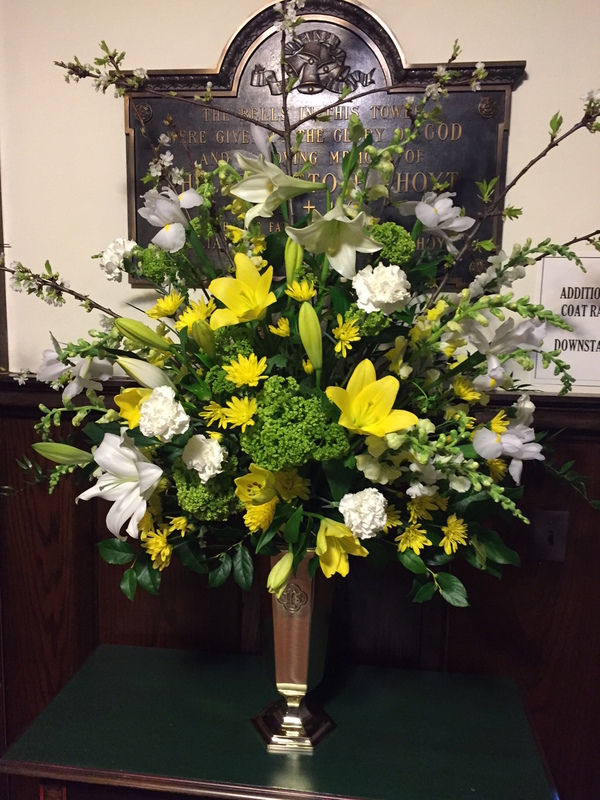 “It’s really just a part of what we do to become physicians and to demonstrate to the public that we have earned their trust — that they can put their faith in us and feel comfortable with it,” Kastufrakis said. The exam also serves as a sort of quality assurance test for medical schools, to make sure they’re teaching patient care skills, said Dr. Lia S. Logio, president of the Association of Program Directors in Internal Medicine. “I think everyone coming to my residency program should pass it, and pass it on the first attempt,” Logio said." Medical school faculty don't have the time? Seriously? That's their job. If medical school faculty, working 9 months a year while planning their resarch projects and next grant application, don't have the time to evaluate the medical students that fund their salaries sufficiently, then perhaps they need to look inward rather than asking medical students to submit themselves to this money grab. Medical school is already incredibly expensive (private schools here in Chicago enjoy a tuition and fees of over $54,000/year). Certification and licensure fees are many more thousands on top of that (again and again and again). Unnecessary testing is a waste of time and resources for physician-trainees who are increasingly thrown under the bus by the non-practicing bureacratic elite. The whole process needs serious reassessment. Otherwise, our best and brightest will understand all too soon what they're up against and that won't be good for the "public" at all. I suggest the NBME stop Step 2 CS and adjust their budget accordingly. Addendum: Interesting that the NMBE made $136 million in 2014 from testing fees, 50% of which went to salaries. Medical Specialty Certification in the US - A False Idol? For the first time, the history of the ABMS/ABIM board re-certification corruption scandal has reached a peer reviewed medical journal, the Journal of Interventional Cardiac Electrophysiology. I hope practicing physicians here (and others worldwide) take time to read the history and evolution of board certification in the US reviewed in the article and to review the associated references. I would like to thank my co-author, Edward J. Schloss, MD (Twitter: @EJSMD) for his contributions to this work and the many helpful editorial suggestions made by the JICE reviewers. It is time we reconsider the ABMS "Maintenance of Certification" (MOC) program. It is also time to have an independent audit of the financials from 1989 to 2016 from the American Board of Internal Medicine and its Foundation, including full disclosure of the many financial conflicts of interest within the American Board of Internal Medicine (ABIM), the ABIM Foundation, and each of the 24-member boards that comprise the American Board of Medical Specialties. Finally, a full investigation of misleading tax filings and lobbying disclosures of the ABIM as a public tax-exempt 501(c)(3) corporation by the IRS and Department of Justice is long overdue in light of these revelations. Fisher WG and Schloss EJ. Medical Specialty Certification in the United States - A False Idol? J Interventional Cardiac Electrophysiology doi: 10.1007/s10840-016-0119-4 Mar 8, 2016.